A company focused on software development for VoIP and digital PBX. Our client decided to enter the market with the new B2B product for small office/home office (SOHO). They already had a software product for VoIP services but it behaved differently with different hardware. They needed to design their own device so not to depend on vendor-supplied chips and libraries. Having no experience in hardware design, they chose Promwad as a technology partner with expertise and a trustworthy portfolio with telecom projects. We have designed and prepared for mass production an advanced VoIP modem router that provides all types of office communications. Our engineers designed an enclosure, hardware, low-level software, and Linux-based middleware, as well as stands for functional testing at the production site. connection with peripheral devices and operation of network storage (NAS). 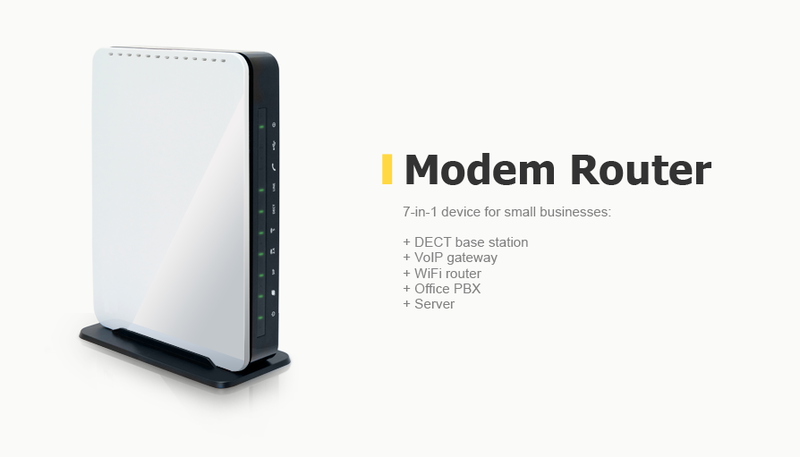 Our client received not only the 7-in-1 device but also one of the first modem routers with DECT base station on the market. It supported up to 6 handsets. Another competitive advantage is the integration of a ready-made VoIP software of our client with his own hardware solution. As a result, he guaranteed his subscribers a stable operation of the equipment. Thanks to the use of software components with open source code and Linux distribution, there are wide options for adapting and developing firmware for the device in the future. The production volume of this B2B product has reached 20,000 units. Connection to a public telephone network, provision of IP telephony services (SIP-proxy, RTP-proxy), firewalling, L2 / L3 switch functions, VoIP gateway. Using the device as a network storage (NAS), FTP-server and Torrent-client. For data storage, the drives connected to USB ports are used. Configuring the device via the web interface or the command line (CLI) using the SSH and Telnet protocols. Updating the software from FTP / HTTP-servers or USB-drives. QoS support for setting the priority of service for various types of traffic. Proxy requests to the provider to connect to streaming video multicast (IGMP) from the local network. Support for IGMP-snooping on the built-in switch, which prevents multicast from entering other Ethernet ports. All solutions of our industrial designers and mechanical engineers were tested on the models that we created with 3D printing. Painting, imitation of color and textures have been realized manually. The graphics on the buttons and the indicators were printed in full. After agreeing upon the design, 3D models of body parts were designed taking into consideration manufacturing technology – plastic injection under pressure. Casting inclinations, allowances, etc. were taken into account. We have developed a set of design documentation for the production of molds the parts of the device enclosure. For the production of the front panel, we used the IMD technology (in-mold decoration): a method of surface decoration of plastic products with special film carriers. Expanded VoIP settings based on Asterisk: prerecorded voice messages (IVR), setting of complex rules for managing calls, etc.